FANBOY PLANET.com . : mc-deathlyhallows :. In honor of Daniel Radcliffe and I having a shared birthday, it's only fitting to review the gift that J.K. Rowling gave both of us. (Daniel turned 18 today…I did not.) With Harry Potter and the Deathly Hallows, the teen actor gets a glimpse of the day when he will be free to pursue other roles, and I got a fantastic adventure story that fittingly, and only somewhat comfortingly, brings the long epic to an end. The family took off on Saturday because "Dad's going to read Harry Potter." Everybody else in the family is a few books behind; in particular the 3-year-old who at least has learned to recognize the jagged logo. Trying very hard not to spoil anything ahead of time, all I knew was what Rowling had said for at least a year: characters die. Brilliantly, she uses that promise against us, feinting left and right in the plot to tug at heartstrings long before the crushing blows. It shouldn't be a surprise, after all. The books have gotten successively darker, matching a readership that more or less would have grown up as Harry did, seeing the world as a greyer place, getting angry about it and fighting against it. And indeed, it's not like from the very beginning she didn't set up Harry as the nemesis of the worst mass murderer in the wizarding world. Apparently, some people missed that. So Harry Potter and the Deathly Hallows delivers on everything promised in the earlier six books. Rowling puts Harry through loss, but also through love. If you remember from your teen years, yes, things weren't as black and white as you thought they were, but that also can lead you to a new understanding in which some people and things were better than you thought. 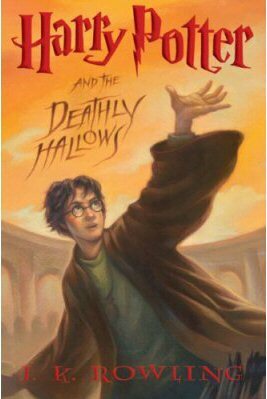 Harry truly becomes a man in this novel, with Ron appropriately lagging behind but eventually catching up. All three friends learn about faith, hope and courage; in short, all that makes life worth living. It slows a little in the middle after a great start, but then rolls back into an exhilarating finish. Rowling also utilizes newspapers and wizard books to greater effect here than ever before , filling in a lot of backstory and raising a lot of questions about things alluded to for several books that happened decades before. While the movie adaptations have been getting shorter and shorter, let me make the plea now that this one goes back up to three hours plus - for the first time, there are too many set pieces I'd be really annoyed to see cut. I can't give any spoilers on those sequences, but Rowling proves herself a much better writer now than she was when she started this whole thing. Scratch that - what makes her worthy is that she is an incredible storyteller, and those are the people we'll be reading a hundred years from now. Good thing that family left me alone. I'd have accidentally given things away for them as I teared up over certain deaths, gasped aloud at some sudden plot turn I should have seen coming but didn't and laughed in triumph when things went well for the characters. For now, when people ask me what's the best movie I've seen this summer, I'm going to have to recommend this book.